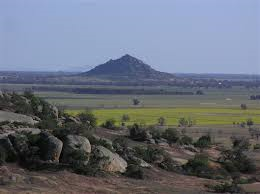 Pyramid Hill was named after the adjacent granite hill (known as the ‘Hill’) with its many interesting rock formations. The original survey for the township was on the south side of the hill, but with the opening of the railway in 1885 the town was moved to its present site. 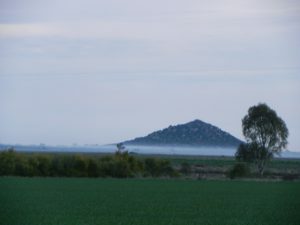 A cairn on the southern slopes of the granite pyramid commemorates the explorer Major Sir Thomas Mitchell who discovered and named this area on June 30th 1836 during his journey into “Australia Felix”. From the top of the hill, which rises 187m above sea level, there is a wonderful view of the township and surrounding irrigated farmlands. 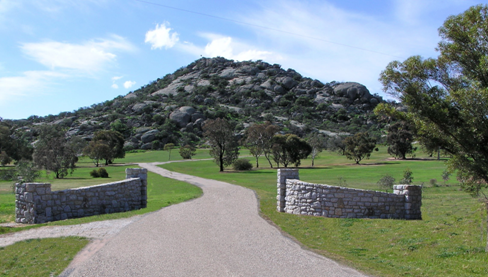 A 2km safe and attractive walking track winds around the base of Pyramid Hill, linking to an existing 3km walk from the town. For the more adventurous the track also extends across the “saddle” of the hill. Wildflowers abound in the spring and the hill reserve is a popular picnic spot with tables, a barbeque and toilet facilities. The picturesque 18-hole Golf Course surrounding the hill is open to members & visitors from April to September.